In a lot of ways, Lisa Napoli’s Radio Shangri-La (Crown) reminded me of Deborah Rodriguez’s 2007 bestselling Kabul Beauty School. Only better, if for no other reason than the writing here is just so sharp and terrific. Like that book, an unlikely set of circumstances take a more or less average American woman and transport her somewhere unexpected. In Rodriguez’s book, a memoirist brought beauty to someplace where beauty had been largely forgotten. 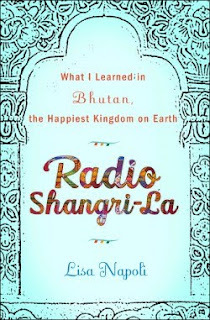 In Radio Shangri-La, the memoirist is herself transformed as she helps to create Bhutan’s first youth-oriented radio station. Napoli finds herself in “the happiest kingdom on Earth,” as part of a force that is changing the culture and wondering about her part in all of that. A radio station may seem quaint and retro, an old-fashioned medium in this age of all things digital and pod. But in the last Shangri-la, it proved to be an invention as modern as a spaceship. More than anything, Radio Shangri-La is about transformation. The awakening of a sleepy kingdom to the inevitably cold dreams of the modern world and, of course, Napoli’s personal transformation as she trades her self-dubbed midlife crisis for peace -- an even joy -- in the magical kingdom.